When the 10th annual Land Rover Palm Beach International Gay Polo Tournament, presented by RSM US, returns to Wellington from April 4 through April 7, it will bring with it a growing list of sponsors helping to make the event a success. 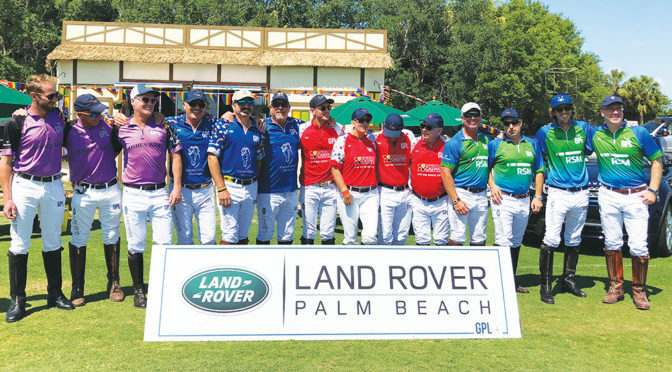 Land Rover Palm Beach continues its longstanding commitment to the community as the title sponsor of the event for the third year. Whether it’s supporting local high school athletics, the area Boy Scouts council, or the dealership’s strong ties with Furry Friends Adoption Clinic and the Ranch Humane Society of Greater Jupiter/Tequesta, Land Rover Palm Beach enjoys supporting the community. No stranger to equestrian events, Land Rover is a longtime supporter of equestrian sports, with decades of show jumping and event sponsorships. Land Rover Palm Beach’s 2019 status will further solidify its pre-eminence in the equestrian sphere. As an elegant luxury brand, Land Rover Palm Beach aligns perfectly with the vision of the Gay Polo League’s flagship tournament, and the capabilities of Land Rover’s vehicles equally match the rigors of equestrian sport. GPL is also thrilled to welcome back RSM US LLP — a leading provider of audit, tax and consulting services focused on the middle market — as the event’s presenting sponsor. RSM’s goal is to deliver the power of being understood to clients, colleagues and communities. Initially introduced to GPL through a major wealth management client, RSM’s support has grown tremendously over the years, as has the firm’s commitment to the LGBT community. Meanwhile, Cherry Knoll Farm returns as the tournament’s VIP tent sponsor. Located at midfield, VIP guests will experience excellence from the ground up, feel the power of the ponies as they race toward the goal posts and be front and center for all the action. The royal treatment includes tableside service throughout the day with a full open bar and a gourmet lunch buffet catered by the International Polo Club Palm Beach. Cherry Knoll Farm, located in West Grove, Pa., operates on the philosophy of “quality over quantity.” This is true for its great success throughout the Angus industry, as well as high-performance equestrian sports, such as show jumping, dressage and para-dressage. Cherry Knoll Farm owns some of the most esteemed high-performance Grand Prix dressage horses and show jumpers in the industry today. Other sponsors include Black Hound Sports, Celebrity Cruises, Cedar Crest Stables, Chervo, Consign & Design, David Lerner Associates, Discover the Palm Beaches, Douglas Elliman Real Estate, Eau Palm Beach Resort & Spa, GJ Racing, Goshen Hill/Caroline Moran, OutClique Magazine, the Palm Beach County Sports Commission, Patricia Quick, RBC Wealth Management, Seminole Casino Coconut Creek, Sperry Tents Miami, Stefano Laviano, the Tackeria and Wölffer Estate Vineyard. Tickets for the 10th annual International Gay Polo Tournament and its festivities are currently on sale at www.gaypolo.com/tickets. The Gay Polo League is still offering sponsorship opportunities at different levels for the tournament. For more information, contact Chip McKenney at chip@gaypolo.com.